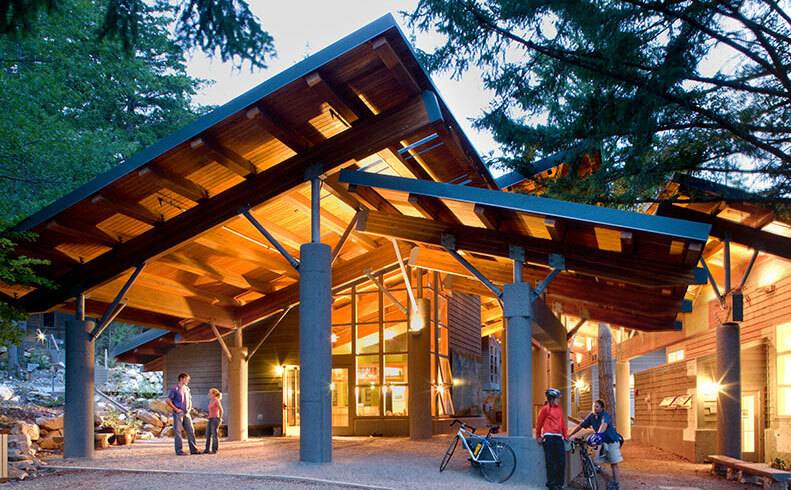 The Wild Ginger Library supports the North Cascade Institute’s mission of inspiring people to conserve and restore Northwest environments through education. Located at the North Cascades Environmental Learning Center on Diablo Lake in the heart of North Cascades National Park, our library provides books and other resources to help people think about and understand the world around them, engage in discussions on environmental problems, and see their relationship to the broader world. 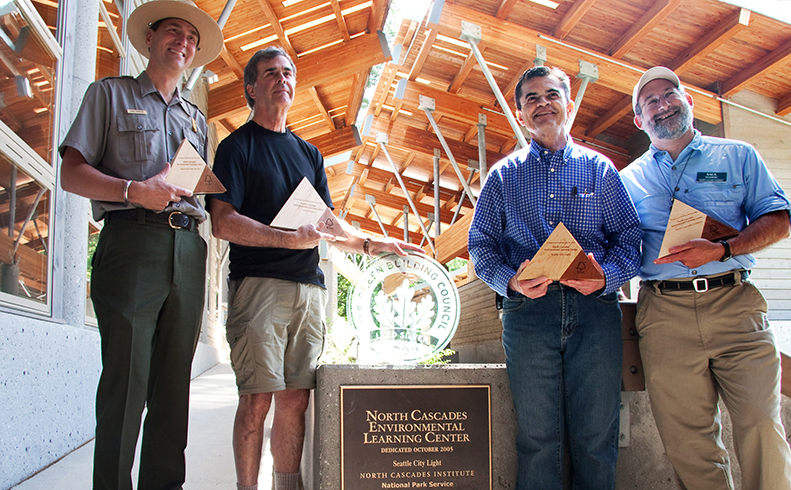 The library particularly focuses on information and stories of the Pacific Northwest, especially the North Cascades. It collects, maintains and shares resources that help people of all ages learn more about the literary and oral stories of the area. 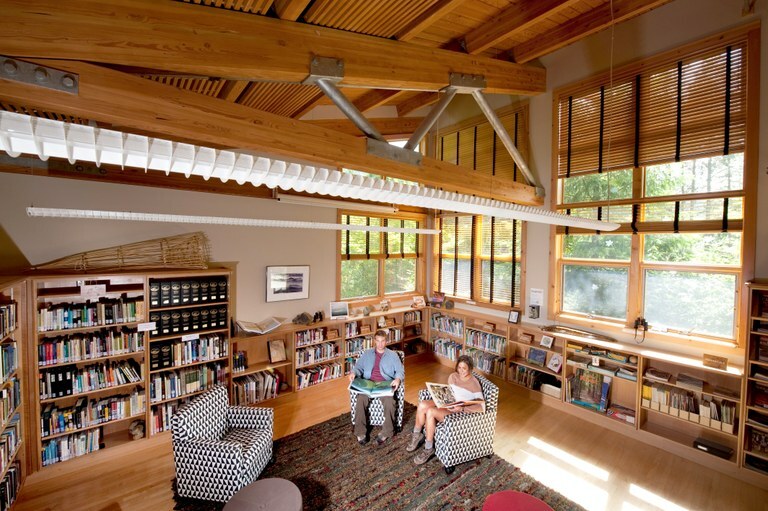 The Wild Ginger Library also exposes individuals to issues surrounding placed-based education, conservation, environmental restoration, sustainability and the management of non-profit organizations. The Wild Ginger Library was dedicated in July 2006 in memory of author and Northwest outdoorsman Dr. Fred Darvill (1927-2007). Although the library was dedicated a year after the Learning Center opened, it was envisioned and shaped from the early stages of the Center’s conception in the 1990s. When the Learning Center opened in July 2005, the Wild Ginger Library – named, like other buildings on campus, for a local native plant – remained empty of books and materials. The delay was intentional for two reasons. First, Institute staff needed time to settle into the Learning Center, to get a sense of how the youth and adult programs could best use a library’s resources and gathering space. Second, the Learning Center required continued fundraising, and the library provided a compelling centerpiece for this effort. Dr. Fred Darvill pledged significant support and gifts from other individual donors soon followed. In addition, early in-kind donors of natural history books included University of Washington Press, Lone Pine Publishing, Sasquatch Books, and The Mountaineers Books. The Wild Ginger Library is young, but the stories it seeks to preserve and pass on began long ago. In a sense the history of the Wild Ginger Library began more than 10,000 years in the past as Ice Age glaciers receded, and the North Cascades’ first people ventured into local mountains and river valleys. After all, it’s the stories of this place – from Native myths and explorers’ journals to scientist’s reports and Beat poetry written in fire lookouts – that give Wild Ginger its life. Interested in making a donation to the Wild Ginger Library? For a monetary donation, send your check to North Cascades Institute with “Wild Ginger donation” in the subject line. If you have books, journals, maps or other North Cascades-related materials that you would like to donate to the library, please contact us and we will send you our donation policy. Thanks!